Today’s Final Jeopardy answer (in the category 20th Century Disasters) and statistics for the Tuesday, January 29, 2019 game between Niño Yosinao, Chris Whalen, and 1-day champion Jill Regan. 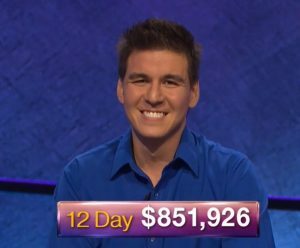 Steven Oppenheim of Shaker Heights, Ohio, returns as champion on Jeopardy! – see who joins him here!